What is more relaxing, than having a few friends over on a warm summer day, having a barbecue and a nice cold beer, then bringing the TV outside and watch the game or even a movie, while having a relaxing bath in a cool LED show? It also works at parties too: your friends will want to come over every weekend! You can have your own SaluSpa Paris AirJet Inflatable Hot Tub with LED Light Show! Sounds cool, right? Well, let's go ahead and take a look at the specifications, that's what interests us the most, right? A cool nice brown color that resembles wood, with a 77-inch round-shape and a height of 26 inches, it is suitable for a small group of 4 to 6 person. You will no longer have to go to the local sauna or spa resort, surrounded by foreign people that you are not familiar with since you can have your own spa massage at home. It can host a quantity of 250 gallons of water at its capacity of 80%, with an actual water flow of 350 gallons/hour. The maximum heat capacity is 104 degrees Fahrenheit, which is a really hot temperature for those who enjoy taking a bath in high temperatures. The LED light show is provided by a remote controlled strip, providing seven different colors that will help your imagination go wild or relax during a nice bath. The SaluSpa Paris AirJet Inflatable Hot Tub with LED Light Show is of superior strength and durability, with an exterior that resists to punctures due to its TriTech 3-ply material, with polyester covered by PVC layers. Even its cover is inflatable, to provide more efficiency and safety. When shipped or transported to another location, it weighs only 76 pounds, so it's easy to take anywhere, anytime. There is one thing that you should be careful, though the electricity bill. It uses a 120V power source available in any home, with a rating of around 110-120V at 60 Hz, with an electric current of 12 Amps at 68 degrees Fahrenheit. If you are the type of person who likes to save money, you will save money buying this SaluSpa Paris AirJet Inflatable Hot Tub with LED Light Show instead of going to a swimming pool, but you will need to watch an eye on the electricity usage too. However, using it once or twice a week will not be such a problem; however, if you are planning to be a daily user (and you will become one, once you test it), then save some money for the bills too. 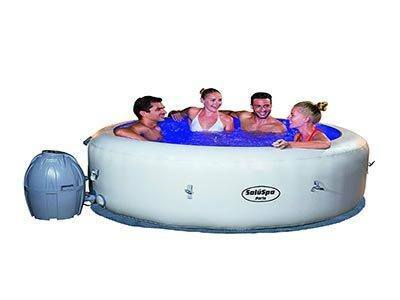 This SaluSpa Paris AirJet Inflatable Hot Tub with LED Light Show is unique and different from other inflatable pools from its range, due to the fact that it is equipped with multiple colored LEDs that increase the relaxing atmosphere. Even though it is a bit more expensive than others, it is a lot larger and allows a higher number of adults to stay inside warm waters. It has a faster heating system, which can provide approximately 2-3 degrees Fahrenheit per hour. If you don't want to fill it directly with warm water, you can prepare it in the morning, then take care of your other duties and by the end of the day you can relax and forget about all the stress you encountered during the day. What's the best way to end a romantic evening, after watching a nice movie? A hot bath that will relax you both! No matter if you are an elder person. Make yourself remember how it was 30 years ago, when you had no muscle or bone pain! With a hot bath, followed by a bubble massage and a cool light show you will smile again and forget how time passes! This model is a great choice for the professional person to relax. I would say that they need it the most, but that might mean that I am lying. However, business people need to relax and escape from daily tasks as much as possible, in order to live a long and happy life. Besides, when you relax your brain more ideas start coming, so this is a nice meditation method as well if you are trying to focus on completing a project that you have been working on for a long time. Overall, great decisions are to be taken under calm and peaceful moments, when your brain can analyze all options without any disturbance. Instructions for installing and maintenance are user-friendly. Some users say that the Paris model is even better than the Miami version. The material is nice and soft, similar to leather. The tub surround is made from the same material, making touch elegant and soft in every spot. Water temperature can increase to 40 degrees, for people who enjoy really hot baths. It has a large diameter and it can be used by four to six persons. Bubbles offer a nice relaxing moment. Bubbles are not too violent or at a high rate, just slow enough to make your body relax and enjoy the moment. The remote does not come with batteries included for the LED system, so these need to be purchased separately. The cover doesn't keep continuously air and it needs to be connected to the air pump once in a while. The replacement filters need to be exchanged weekly if you want to keep your inflatable pool up and running daily. The temperature increases slowly since the pump does not have enough power. Question: Is this suitable for long term use? Answer: Yes, with a little bit of care, you can use this Hot Tub for a long time without any major issues. There are fewer complaints from the existing customers. Question: How to deflate the Tub? Answer: There is a valve in the tub which is easy to use. You can deflate the tub with this valve. Question: Can I use pool suppliers with this hot tub? Unique, smooth at the touch and relaxing: what is not to like? This SaluSpa Paris AirJet Inflatable Hot Tub with LED Light Show will bring you joy and peace in a world filled with stress sources. Even if you are planning to have some friends over, or you just want to have a moment alone, this hot tub is the right choice for memorable moments!